The Trabon USP Divider Valve from MotionSource offer series progressive metering in a one-piece block with no assembly required! 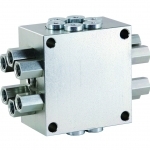 It requires no special fittings, all fittings come with the USP valve block. Also, new with Trabon USP divider valves, the USP doubling plug for combining outlets on Graco USP valves. Call us for a free quote or technical help at 888-963-6686 , email us at Sales@MotionSource1.com or use the “Quick Quote” form to the right. The USP Valve should be ready to install in your system. It has been factory-tested and should not require any additional modification. As long as lubricant is supplied under pressure, the valve will continue to operate . Whenever lubricant flow ceases, the valve pistons stop. When flow resumes, it will start again at the same point in the discharge cycle. Each block ships with the correct number of outlet adapters and seals. Install one adapter into each open outlet port. Be sure a seal is installed on each outlet adapter. Outlet adapters have standard threads for interfacing with tube fittings. Looking for technical data? Product manuals? Our expert technicians are available to help. When you’re working with MotionSource, you’re working with “The Source”.